Unlike any other auto repair service, collision repairs can not be ignored. Every time you walk out to your car in the morning or take your damaged vehicle on an errand, you see the ugly dents and scratches left behind. Our collision repairs will “feel” like magic because we get them done so quickly. Whatever nasty impacts you’ve experienced, we want to turn back the clock. You remember how nice your vehicle looked and drove before the impact, and our team wants to take you back to that moment. Scottsbluff Body & Paint in Scottsbluff, NE is a total car body care provider. Depending on the severity of your collision, the insurance company may say that your car is totalled. We’re auto body repair service experts, and it’s our business to raise vehicles from “the dead.” You’ve grown accustomed to your vehicle and you have no interest in losing it forever. That’s why you need to receive an independent quote from our specialists so you’ll have the most complete information when making a collision repair decision. Our qualified technicians perform the services turn your vehicle’s collision into a distant memory. Understanding our customers is a priority for our team. We take the time to meet with you after any accident, so we can explain exactly where you stand. Collisions usually come out of nowhere, literally! Any accident is in store for a more stressful process at any other collision repair shop. The entire collision repair process is made much easier and hassle-free at Scottsbluff Body & Paint. 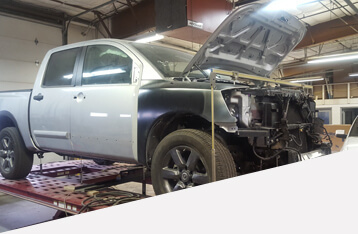 Our team has decades of auto body repair experiences from which to draw. We handle the extent of your possible collision repair needs. If you get rear-ended and you need us to straighten your rear bumper, we handle it with precision. Or if you’ve been involved in a head-on collision that has “totaled” your vehicle, we’re still the first collision repair facility you should call. Trust, convenience, and quality are three of the qualities our customers have come to expect from Scottsbluff Body & Paint. After any vehicular accident, big or small, you’ll need a collision repair tech that you can trust. We’re confident that you’ll drive away from our facility with a big grin, happy that we’ve been able to give your vehicle the look and feel you remember. If anything, you get your vehicle back in better condition than when we found it. Give us a call today at 308-632-1839 to schedule your next appointment. Can’t find your phone? Don’t worry, you can go ahead and schedule your next appointment using our online scheduling system. Just pick a day and time that works for you, and we’ll meet you. Any auto body and paint repair needs should come to us first! Our exceptional services will bring back old memories of your vehicle’s shape, shine, and performance.